Bill: Finally living out my dream of retirement!, Um, Hilary aren't you a little overdressed? What is this you ask? It's this super awesome Hillary Rodham Clinton presidential playset. Visualize Hilary as president and play out all her roles with this super clever and fun paper doll set. 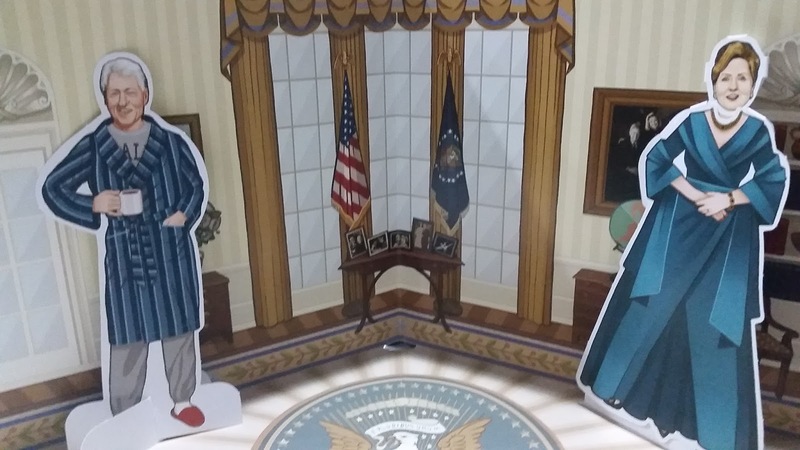 The set includes several characters like Hilary, Bill, Republican adversaries, and White House ghosts! There are two "sets" several costume and hair changes, and props. There's a little pocket in front where you can store your dolls. The dolls could be a weeeee bit sturdier, I had trouble keeping Hilary standing up though Bill did fine, but the idea is just so clever and fun. Which is where I say, don't take this as a political endorsement, it's not. I just thought this was super cute and also a great holiday gift idea. I received a copy from Quirk Books in exchange for posting a picture with my caption!